Renewing your existing passport or visa, applying for a new one and similar types of actions can take six to eight weeks or more depending on the area of the country where you live and the time of year that you’re submitting your paperwork. If you’ve got a big trip coming up in a few days and suddenly realize that you lack the appropriate paperwork, you may not have enough time to wait to go through normal channels. 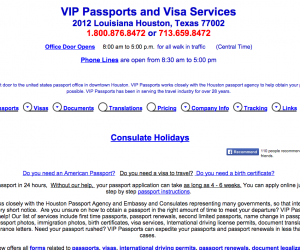 Thanks to VIP Passports, however, this isn’t actually a fear that you need to have any longer. They’ll take all of your important documents on your behalf and will submit them for you. You can have your new documents in your hand in as little as 24 hours.